Dude of the House: Whole Wheat, Sweet! Old habits die hard. Or as we say around my house, picky eaters are those residents currently under the age of 3. You know by now, the Little Dude takes pickiness to a new level. His eating habits have gotten better in some ways, like just yesterday he ate a grape tomato at our local farmers’ market, but in many other ways there is no progress either forward or backward. He still won’t touch a piece of pizza, which is both frustrating and ironic since my blood type is practically Marinara. The one genre of food that he will eat pretty much any time (beside candy) is breakfast. I’ve told you several times about his affinity for IHOP, or as I sometimes refer to it, TORWMKWESFTM (The Only Restaurant Where My Kid Will Eat Something From The Menu). Not quite as catchy of an acronym, so we’ll refer to it as IHOP here. The kind bubble-lettered people at IHOP asked me if I wanted to check out some new items on their menu, which presented an interesting conundrum. I know that the Little Dude likes IHOP’s Baby Cakes (aka silver dollar pancakes), but as a creature of habit would he try something new there? I took their offer as a challenge, and also as the opportunity for a free meal. Since I’m a high roller, I invited the pregnant Mrs. Dude to join us at IHOP for our big night out. With our IHOP outings usually reserved for Dudes’ Days, this was a rare treat for her. Or at least that’s how I pitched it so that she’d attend. We went for Breakfast for Dinner on a recent weeknight and immediately noticed the giant glossy pictures of the new Red Velvet, Sweet Strawberry & Whole Wheat Pancakes all over the restaurant. As Mrs. Dude has a chocolate allergy, we nixed Red Velvet and ordered the other two new flavors. And just to be safe we ordered the Little Dude some of his beloved Baby Cakes. Oh, and some of the amazing looking Cinn-a-Stack pancakes, too, to balance out the looming healthiness of the Whole Wheat. When everything arrived, our table looked like Dr. Atkins’ worst nightmare. Luckily I’m a professional carbaholic, so I could handle it. I decided to see if the Little Dude would eat the Whole Wheat pancakes. I cut a few bites and poured the brown maple syrup he likes on top. When he bit in, he knew something was a little different, but he went with it anyway. For about 4 bites. Then he decided he’d been adventurous enough for one night and I agreed so he went back to the Baby Cakes. He tried them and didn’t spit out the first bite. That’s a win in my book. The advertised Whole Wheat pancakes (above) looked pretty close to the picture of the real product (below). Mrs. Dude and I shared the Whole Wheat, Sweet Strawberry and Cinn-A-Stack pancakes for a more objective take. The Whole Wheat was a bit grainier than IHOP’s standard pancakes, but that’s what whole wheat normally is. They weren’t bad and if you are going to eat healthier, there are definitely a lot worse options. They place banana slices on top of these pancakes which add a little moistness and also make them slightly resemble a crop circle. When we’d ordered, I asked the waitress what the difference was between the new Sweet Strawberry pancakes and the regular Strawberry pancakes was. She told me “nothing”. That wasn’t quite accurate, however, as the new ones have a cream cheese glaze drizzled across the top. Beyond that, they seemed very similar to this IHOP regular. These new ones were good, but as someone who was getting a root canal two days later, I wish they’d been served with a side of fluoride. IHOP’s marketing team was not kidding when they named them “Sweet” Strawberry. The real Sweet Strawberry pancakes (below) look like a volcanic eruption of the official picture (above). So would I order these new items again? Surprisingly, of the two new styles I’d actually order the Whole Wheat again. I expected them to sit in my stomach like a ton of bricks, as whole wheat/grainy food often does, but that wasn’t the case here. Were they as light and fluffy as the regular IHOP pancakes? No, but that’s why I’d order a side of Cinn-a-Stack again to go along with them. They made an interesting, and ironic, complement to each other. And for my picky Little Dude, I see more Baby Cakes in his future. "I take my pancakes very seriously"
Yes, we went to town. 1) Leave a comment below stating your interest in participating in the contest along with your favorite IHOP item. 4) Follow me on Pinterest and share my pics from or this story there. You can earn up to four entries per person. Winner will be randomly selected on Friday August 17, 2012 at 3:00pm PST. 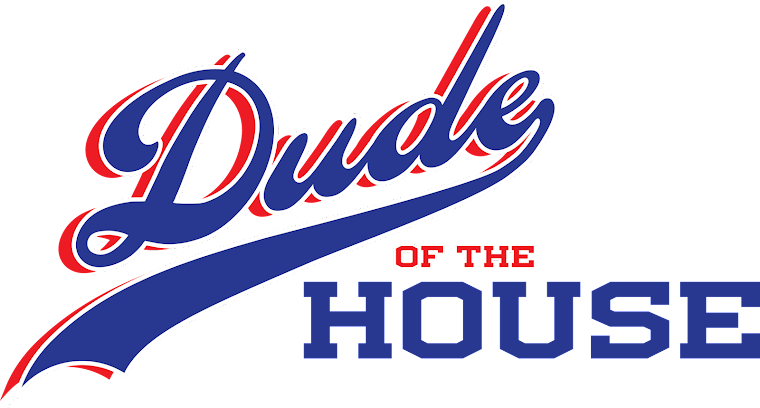 Winner will be notified via a blog post on Dude of the House and will have 24 hours to respond or another winner will be chosen. The opinions expressed in this post are entirely mine. And partially my wife's. IHOP gave me gift cards to try their new items in exchange for writing this post. This sounds awesome!! My hubs loves IHOP. I'm heading to Pinterest since its the only one I don't follow you on. My favorite is the mushroom and Swiss omelet and the New York cheesecake pancakes. So good. I already like you on Facebook and I don't use twitter or pinterest, bummer. Love your t-shirt, Jay. Way to represent! Dude, you have a beautiful family. You also have a beautiful ihop. I see landscaping. No landscaping at our ihop. However, there's a drunk guy with the scabies hanging out in the parking lot. Oh, and ps. This post made me hungry. Would love to enter! I love just about all of IHOP's pancakes especially the buttermilk ones they are just so much better than anything I've ever made at home. I would love to try those Red Velvet ones! I would love to win a IHOP gift card, it's my daughter's favorite. Her favorite is the Jr. slam. Love to splurge on the Cinnamon Stuffed French Toast. That's whole wheat, isn't it? My kids still love a Funny Face Pancake! I like the pancakes and hashbrowns at IHOP. The Chicken Florentine Crepes look/sound divine! Wanna participate! LOVE their stuffed french toast! Count me in! Ham &the cheddar om + buttermilk pancakes. Good stuff. I recently started eating at IHop again after several years of having not visited their restaurant, and I love their Cinnamon Stuffed French Toast, so I would love to win this giveaway! Yum! Would love to win - my fave is pancakes w/ butter (no syrup) and eggs over medium. Count me in! I just love their Swedish pancakes...yum! They also make a mean omelette. Oh IHOP! I love their pumpkin pancakes - too bad they only make them in the fall. I want to win this. I ate there a few weeks ago and had the Philly Cheese Steak. That has to be my favorite. I like you on Facebook and wrote on your wall. IHOP is DELISH! I LOVE their crepes, all of them, and my son loves their pancakes with the smiley face. Liked & commented on FB.